I grew up in a Christian family and went to church every Sunday as a child. Once I hit my teenage years though doubt took over and I walked away from religion and still harbour strong views against it. Due largely to my refusal to believe in an all powerful deity though, I find religion and those who follow it fascinating. People’s blind faith in such far-fetched concepts baffles me and often angers me when this faith clouds judgement or common sense. As such, I love watching films like Apostasy which examine the subject. I had a particular interest in the film as it follows a family of Jehovah’s Witnesses, a branch of Christianity I know little about and one that is rarely portrayed on film (although strangely enough, there’s another film in cinemas right now about similar issues – The Children Act). With a very positive critical reception to back it up, I quickly got hold of a copy to review it myself. 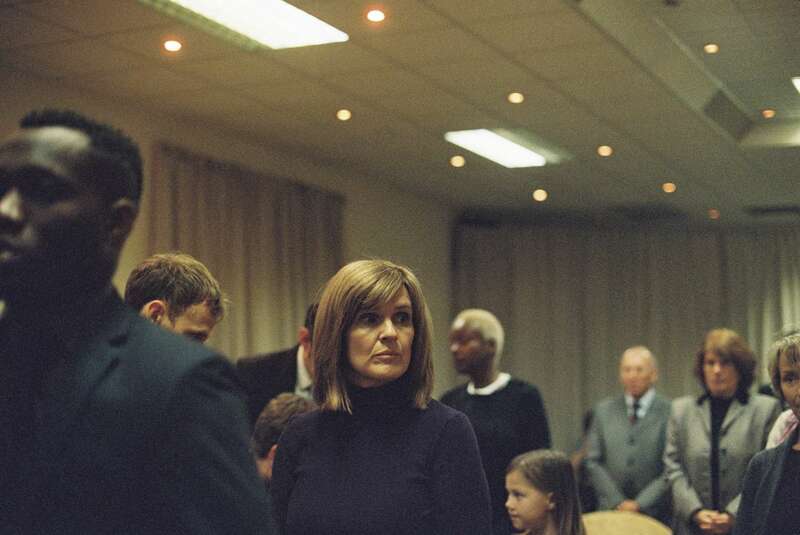 Apostasy follows a mother, Ivanna (Siobhan Finneran), and her two daughters, Alex (Molly Wright) and Luisa (Sacha Parkinson), all of whom are ‘sisters’ of the Jehovah’s Witnesses. They follow the strict rules they must adhere to if they wish to be accepted into God’s ‘new system’ after the impending apocalypse. These guidelines include not being allowed a blood transfusion – an issue of purity. Unfortunately, the 18 year old Alex suffers from anaemia and is in need of a transfusion, but sticks to her guns and ignores the pleas of her doctor. She was forced a transfusion as a baby and is still ashamed of the fact, so is determined not to put a foot wrong as she grows up. Therefore she is doomed to die young, but her religion sees her as a shining example of unbending faith. On the other end of the spectrum is Luisa. Since starting college she has begun to discover more of the outside world and comes home with the shocking news that she is pregnant out of wedlock and, worse yet, the father is not a ‘brother’ of the Jehovah’s Witnesses. The ‘elders’ swiftly ‘disfellowship’ her (i.e. force her to leave the Witnesses). She can try to convince them that she is truly sorry and worthy of bringing back in to their circle, but during this process other Witnesses, including her mother and sister, are advised against keeping any contact with her. So Luisa is cast out from her family as well as her religion. We watch as the three women struggle with this situation and when an even greater tragedy strikes half way through the film, their faith and love is tested even further. The suffocating and damaging effect Sharia law has on people, particularly women, is well known and fairly well covered in cinema these days, so it’s eye-opening and refreshing to see a different, Christian equivalent. OK, the comparison may be extreme and the Jehovah’s Witnesses don’t give out the brutal sorts of punishments the Taliban do, but there is still something very frightening about their blinkered view of the world and this film offers an example of how it can cost someone their life. What is very impressive about the film though is that it manages to damn the practises of the Jehovah’s Witnesses without painting too broad or simplistic a picture of them. First time writer/director Daniel Kokotajlo doesn’t poke fun at the followers (although a Witness video we see is hard not to laugh at) and he doesn’t display them as plainly evil or stupid. It feels even handed despite taking an obvious side against the practise. This sensitive portrayal is probably due to the fact that he is a former Witness and much of the film draws from personal experience. Some of his family are still followers too, so he must have a level of respect for the religion and it shows. Even some of the harder-to-accept rules and beliefs are explained so that we can understand why they are followed, even if we would never accept them ourselves. The cast are also vital in giving depth to the characters, some of which might seem cold and mindless in the wrong hands. The central trio of Finneran, Parkinson and Wright show the love within the family under the surface of their often seemingly cruel actions. This paves the way for some subtle but truly heartbreaking scenes as the film goes on. Robert Emms, who plays Steven – a young elder who courts the ill-fated Alex, is also strong, in a complex role. Some of the line readings can seem a bit forced at times though, so it took me a short while to warm to the performances. This might simply be down to the Witnesses’ thoughts sounding so alien to my ears though. Also, the film is set in Oldham, about 45 minutes away from where I grew up, and I find the closer to home a performance is supposed to be, the harder it is to accept as being natural. Maybe it’s just me, but I always have that problem with films set in Yorkshire and thereabouts (I realise Oldham is in Greater Manchester before any pedants make a comment). Kokotajlo keeps the style fairly low-key, making subtle but effective use of differing colour palettes to create an often oppressive atmosphere as well as to project warmth in appropriate scenes. Shots often present a shallow depth of field too. Perhaps this is to reflect the shallow vision of the characters. Like the Jehovah’s Witness community itself, the film is very close-knit and cut off from much of the outside world. We occasionally see the women out in the community trying to spread the word, but interactions are minimal, other than an early scene where their beliefs are discussed by Alex, Luisa and some of her outsider friends. This approach heightens the intimacy of the drama as well as reflects the sheltered existence of the women. Overall, Apostasy is a deeply moving damnation of blind faith and indoctrination. It manages to criticise with respect though and newcomer Kokotajlo directs with nuance and sensitivity. We are shown why Ivanna takes the steps she takes to ‘help’ her daughters, so can understand her actions, but we also see the pain she endures in doing so. It’s a quietly devastating film that casts light on a world rarely shown on screen, as well as making points about faith and love that are interchangeable with other religions and beliefs. As an atheist, I found the film quite disturbing and painfully sad, and I’d be most intrigued to hear the opinions of someone on the other side of the fence, particularly a Jehovah’s Witness. I can’t imagine the elders would approve of any brothers or sisters watching it though unfortunately. 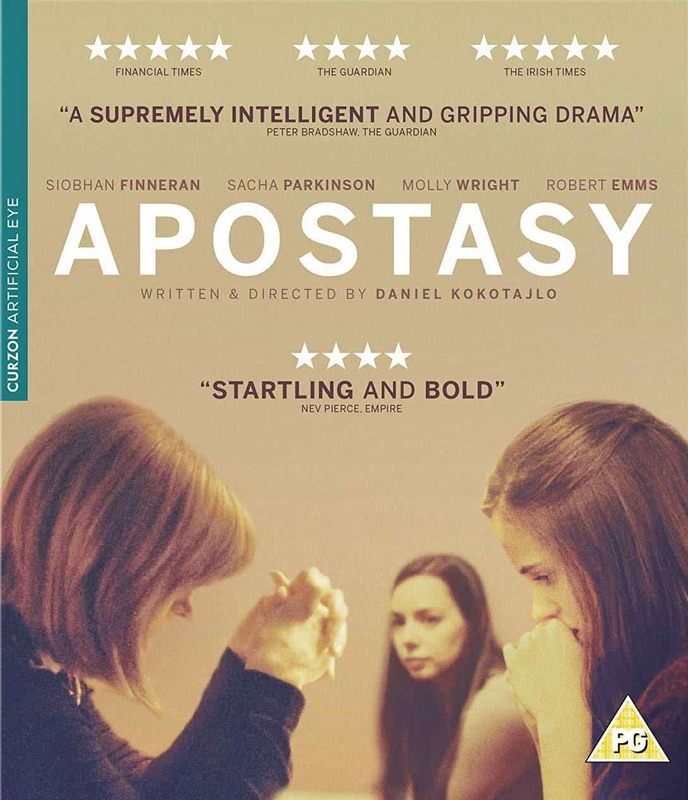 Apostasy is out now on Blu-Ray and DVD in the UK, released by Curzon Artificial Eye. I saw the Blu-Ray version and the film looks and sounds excellent. The ‘Above the scenes’ piece is a little short and throwaway, but the interviews and commentary are worth a watch. Kokotajlo talks a little of his own experiences as well as discussing the production process.